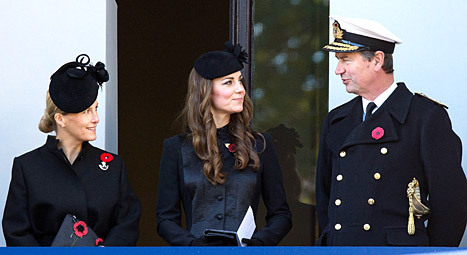 There was a great sense of occasion in London on Sunday, Nov. 10, when members of the royal family gathered to pay tribute to service personnel who have lost their lives in the line of duty. Kate Middleton, Prince William, Prince Harry, Prince Philip, and Queen Elizabeth II were among thousands of people who honored the memory of the U.K.&apos;s fallen soldiers with a two-minute silence and a somber parade at the Cenotaph war memorial. Standing beside the Countess of Wessex on a balcony above the parade, Prince George&apos;s always-stylish mom watched as her husband accompanied the Queen to the Cenotaph. The crowd fell silent for two whole minutes, after which the King&apos;s Troop Royal Horse Artillery fired off a round with a 13-pound World War I gun. The British monarch — wearing a black coat, black hat, and poppies — then laid a poppy wreath at the foot of the monument, per tradition. The Duke of Edinburgh, the Duke of Cambridge, and Prince Harry also laid wreaths, followed by Prime Minister David Cameron, Labour leader Ed Miliband, and Deputy Prime Minister Nick Clegg. Remembrance Sunday was Middleton&apos;s second event in four days. On Thursday, Nov. 7, she and Prince William joined 2,000 uniformed personnel, veterans, and supporters to help raise 1 million British pounds for the British Royal Legion.